Chocolate, coffee and almond meal make this brownie rich in flavor and moist in texture. This brownie is a gluten free treat that will fool your friends. I have topped it with caramel and a few toasted nuts. In a medium size bowl, combine sugar and oil. Using a hand mixer, blend ingredients well. Adds egg and mix on high speed for 2 minutes. In a small bowl, combine vanilla and coffee powder. Stir and set aside. Add almond meal, salt and cocoa to sugar/oil mix. Using a spoon or spatula mix together until smooth. Fold in chocolate chips and nuts. Line a 12 X 8 ,or pan of your choice, with parchment paper. Pour batter into pan and spread evenly. Bake for 30 minutes or until brownies puff up in the center. Cool on wire rack. Once cooled, brownies will settle. 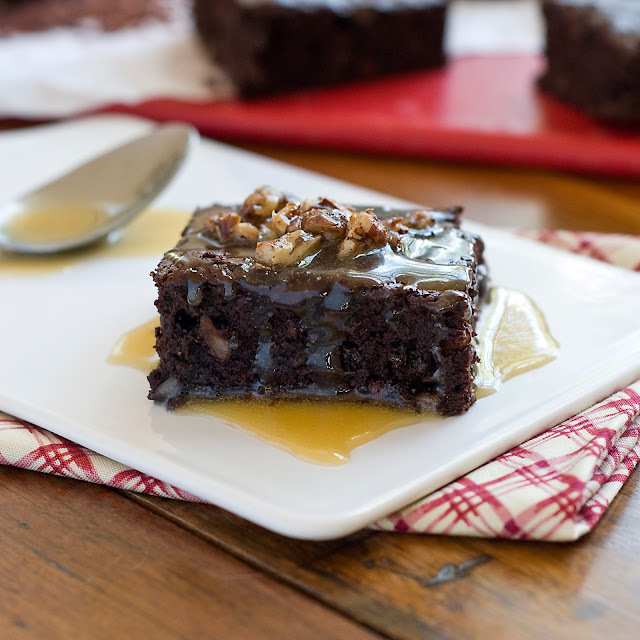 These brownies look absolutely chocolatey and perfect-I love that you made them gluten free! I fooled my family…LOL They thought for sure this was a "regular" flour recipe. Thank you for your comments. Is there a substitute for Almond Flour, my daughter is allergic to almonds.